Entries tagged with “New Year’s Day”. The Sweet Service Award goes to the City of Cape Town , for the collection of refuse on Christmas and New Year’s Day, despite these being very special public holidays. 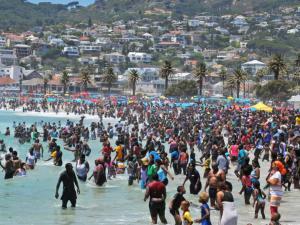 Chaotic Cape Town lacks infrastructure for Festive frenzy in Camps Bay! Yesterday was the most chaotic day I have seen in Camps Bay in 20 years of living in the suburb. 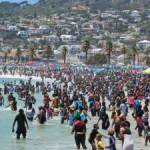 We know that New Year’s Day is busy, and is a stay-away zone, due to the thousands of Cape Town residents who come from other areas and take ownership of the beach in the suburb, without the City of Cape Town sending any reinforcements to secure the suburb. 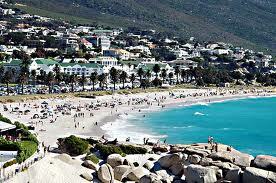 What was experienced in Camps Bay yesterday may be the deathknell for tourism in Camps Bay and Cape Town. We warn our guests to stay away from the Camps Bay beach on 26 December and 1 January, but nothing could have prepared us for yesterday. One should have known that chaos was coming, when all the restaurants on the street level of the whole beachfront strip, with the exception of health food franchise Kauai, were closed for business! When I was advising my guests about alternatives of things to do and places to eat, I had to admit to them that most restaurants in Cape Town are closed on New Year’s Day, despite the city teeming with tourists! I drove down Kloof Street, and was pleasantly surprised that about half the restaurants on this popular restaurant street were open for business, a few proudly Tweeting that they would be open until about 22h00 last night, which is a whole lot better than last year, when only the franchise restaurants were operating. Manna Epicure, Da Vinci’s, Arnold’s on Kloof, Vovo Telo, Hudson on Kloof, Knead, Mozzarella Bar, and newly opened The Black Sheep are some of the restaurants that were operating, and should be commended for feeding the many tourists in Cape Town. The restaurants in the city centre were all closed. In Camps Bay I needed Bay Response at my guest house, but they had to cut short their service when they were called to assist Pick ‘n Pay Camps Bay, of which the front door was being broken down by unruly beachgoers! We heard sirens throughout the day, especially early afternoon, when there was a near-drowning on Camps Bay beach, despite lifeguard services offered. The beach is just too full, and often inexperienced bathers and unsafe rip tides can lead to loss of life.